Reading your posts is like listening to Bach: you know that It is the same basic melody but you enjoy every variation. Sad melody for us humans. I hope you are right about the Great Intelligence but I’m sure you’re right about loving our friends and family as much as we can while it’s possible. Thank you for your effort. With all due respect to everyone here, I find this comparison of Gail’s posts to Bach’s music somewhat… jarring. Bach’s music bespeaks a universe of order and beauty (and I don’t think it’s that repetitive either), whereas Gail’s posts are dire predictions of imminent chaos. Would you mind if I compared Gail’s posts to The Kinks (my favorite band)? This one’s a classic doomer anthem. Let’s have a real fire…. If I had to speculate, I would say that soon after global oil production begins to decline, economic collapse will follow, as less energy available for transportation forces the global economy to contract. That is physics which we can’t change. 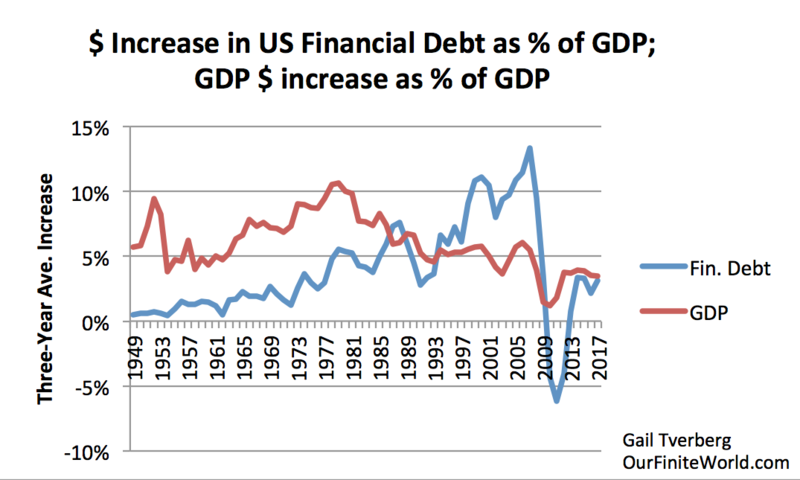 With the record amount of debt everywhere, a permanently shrinking economy will cause so many bankruptcies that the financial system will collapse, like it very nearly did in 2008 from subprime housing debt that went into default. Imagine how much worse a global transportation shortage will be. We can create money. But we can’t put more oil in the ground. So watch out for peak global oil output. And it doesn’t matter what caused the peak. Oil could get so expensive as to become unaffordable, which will result in the same economic contraction. You’ve got to figure that since oil is so critical in transportation, people will try to pay whatever it takes to get some. That has to eventually raise the price a lot, which itself could cause economic problems by reducing demand for everything else. So the economy won’t last too many years after total oil output begins to decline for any reason. When will it happen? Probably before 2030. Everything is so tightly networked that the outcome doesn’t need to look like that. Collapsing debt causes prices to drop very early, because buyers are not able to afford goods and services. 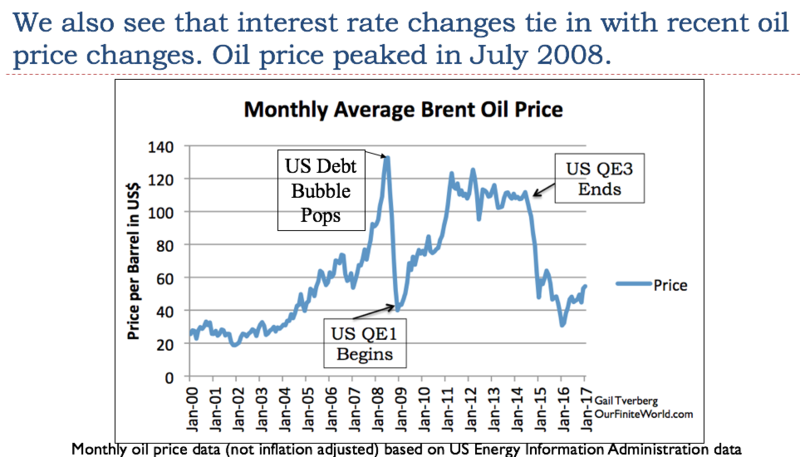 Look at oil prices in the second half of 2008. Oil prices rise, when the economy is doing very well. For example, before the debt bubble pops, in the years leading up to 2008. I think it is really the average price of all energy products that matters. Coal is very much needed to help “average-down” the overall price. Its proportion of the total has been falling. This, by itself, could be a major problem. Most oil use is hidden. Will trucking companies be able to pay double their current price, if they can’t pass it on to customers? Will farmers be willing to raise the cost of the crops they grow, by paying a high price for diesel, if they cannot pass on those higher costs to customers? Perhaps in the US they can, because food is truly a necessity, and incomes are high enough in the US to accommodate somewhat higher food prices. But not in India, for example. The amount you use in your car is a surprisingly small share of the total petroleum consumption. The US is likely an outlier on the high side in this regard. Most commuters, worldwide, do not use cars. Gail, you seemed to be setting up an introduction for David Korowicz’s “Financial System Supply-Chain Cross-Contagion: a study in global systemic collapse” (2012) http://www.feasta.org/wp-content/uploads/2012/10/Trade_Off_Korowicz.pdf , but then he didn’t appear. An open source model of the situation by Josh Floyd is given at http://beyondthisbriefanomaly.org (you will have to start at the very beginning). The software is easy compared to describing the assumptions made over the values and the relationships between the inputs. If anyone can explain it properly, you can. Frackers in the US have NEVER made a profit. They have collectively rung up a debt of $280 billion, but banks and investors seem happy enough, so long as the energy keeps flowing. I suppose they have been given the backing of the Fed. Meanwhile China has to buy its increasing imports from abroad and ship them through the South China Sea. Australia is being squeezed by US pressure to take part in “Freedom of Navigation” exercises, and China’s willingness to buy our coal, iron ore, aluminium, copper, lead, etc and sell us solar panels and mobile phones. The Australian ABC continues to toe the Government line of “neutrality and US ally”, but now has to advertise itself as “Australia’s most trusted news source”. Propaganda still works. We consider one scenario to give a practical dimension to understanding supply-chain contagion: a break-up of the Euro and an intertwined systemic banking crisis. 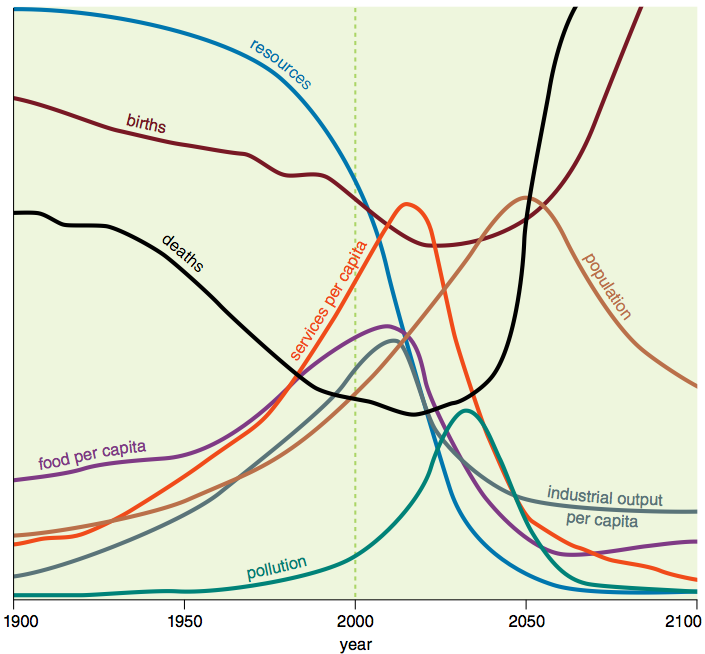 Simple argument and modelling will point to the likelihood of a food security crisis within days in the directly affected countries and an initially exponential spread of production failures across the world beginning within a week. In the not too distant future, we may get to see how the breakup of the Euro really works. Actually, we may get some insights just from the UK trying to leave the European Union even sooner. I am afraid I wasn’t able to figure the link you were talking about. This just arrived in my mail box…… I am posting it in advance … so that when drought hits NZ…. and you read about how burning coal caused it….. you might… you just might …. think that you are being toyed with ….. being played… being suckered…. Being treated as if you are an unthinking, MORE onic…. Re f789ing tard ed …. im be cile…. With the El Nino weather pattern predicted this summer, it could be’ one of the driest summers on record. An un-mulched garden lets the sun beat on the soil and hot soils evaporate water fast. 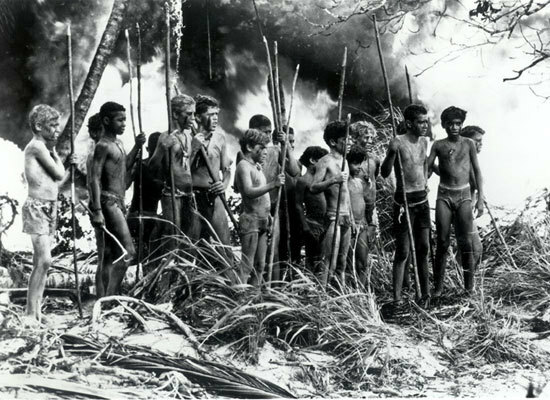 Right from the beginning, under trees in nature, there was a very unique layer of leaves, branches and sticks that allowed many nutritious ingredients to embed into the precious rich soils. This cover stopped exotic weed growth allowing young trees to spawn, helped the soil increase its humus level to deep rich soil and helped store the rain in the soil over dry months. A 10cm layer of organic mulch can cut water needs in half. Mulch keeps water from evaporating quickly from the soil. Organic mulches hold water and increase the humidity. The modern version of this product is available today in Forest Floor mulch. Be proactive and order Forest Floor mulch bark today for your garden. By placing this bark on now, it will preserve the plants for this coming summer. It’s now you need to act, waiting until the heat of summer will hurt your plants more as there won’t be the rainfall needed for the mulch to conserve the water around the plants. i put some bark mulch in the front of our house, under the city shade trees. it was very costly, bought by the bagful at the local hardware store/garden shop. looked nice, for awhile. then, we had a heavy rainfall, and the expensive bark mulch floated away, down the street. next stop, ugly gray gravel cover over black plastic. worked. Thank you for a most illuminating analysis, as I find you always do, Gail. The crux of the climate issue is using the atmosphere and oceansphere as dumping grounds for fossil and biomass emissions. This is another form of debt accumulation that has exceeded humanity’s ability to “pay off” given that even a shift over the next several decades completely off fossil combustion and on to ultra-efficient electrification services delivered through affordable efficiency gains, solar PV, and wind power, still leaves a carbon debt that will drive the global temperature past 2 degrees C.
Negative Emission Technologies (NETs) have yet to be commercialized at affordable costs, except perhaps, large-scale prevention of deforestation, large-scale ecological restoration, and increasing the heat-reflecting albedo of urban areas (this last option could prevent/reduce global CO2e emissions by 50 billion tons according to LBNL analyses, while accruing several trillion dollars in savings and avoided damage costs). Most other NET options, especially BECCS (biomass energy with carbon capture and storage), require vast amounts of land, water and agrichemical inputs. Both fossil and biomass CCS pose long-term risks of leakage. And sucking CO2 out of the atmosphere combined with CCS is prohibitively expensive. More positively, the combustion-to-electrification shift noted above has been assessed by several independent groups, one estimating annual global benefits by 2050 at $50 trillion per year in direct savings and avoided damage costs (Jacobson, Delucchi et al Stanford-UC Berkeley assessment, 2018). Do NOT assume we are. Oh and btf789ing way — you seem to have missed the message ….. we are going extinct very very soon!!! thanks eddy… my 35 year career with “renewable” solar pv yielded a similar realization… but the techno-cornucopian faithful enjoy their “stage #3” bargaining. regardless, thanks for explaining reality to the folks who don’t see it yet. What little high-quality long-term data there is suggests cooling from now until 2030-40, although no doubt the Scribes of the Church of Clim-ate-scien-tology will adjust any cooling away through the Holy Sacrament of Data Tampering. An widely-circulated study which concluded that global warming is far worse than previously thought has been called into question by a math error, reports the Daily Caller’s Michael Bastasch. I find it this amusing that the errors in calculations, in models , etc ALWAYS indicate Gggg Www is going to kill us. But…..the sky is falling pronouncements are all fake. As I have stated – if Al Gore were to state that the whole ____ ______ thing was a ho ax… the groopies would be on the attack …. accusing him of selling out to big oil and coal…. there would be two minutes of hate every day for Al …. This is proof that the MSM is capable of making 1+1=4. A circle becomes a square… up is down … really.. it is…..
And when the earth tilts and we get abnormally cold temps… Don Draper will give us … g…lllo…bal coooooling…..
tottenmichael….rubbish….who gave you your talking points? These papers are basically untrue. We will all be dead, if GHG emissions go to zero. There are so many assumptions in the papers that it becomes difficult for reviewer to see the flaws. Also, virtually no-one understands the extent to which the economy requires energy consumption. @Gail thanks for the article – succinct bird’s eye summing up of the current situation. 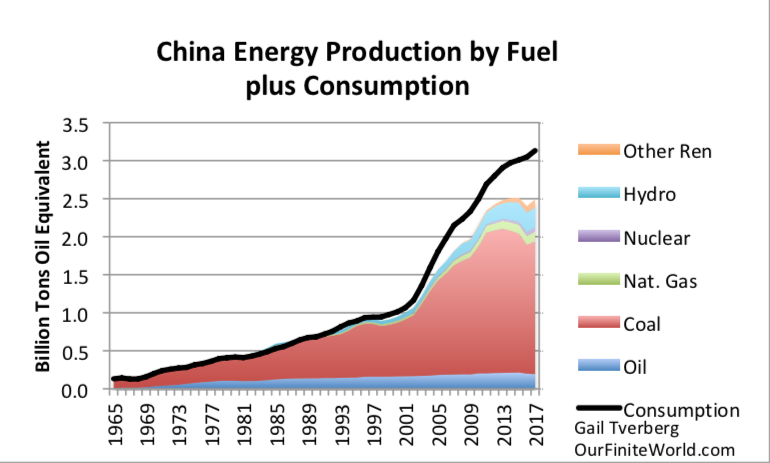 By the way, what is the source for the China energy prod graph? China’s production and the consumption data come from different sheets in 2018 BP Statistical Review of World Energy. From “Life 3.0 – Being Human in the Age of Artificial Intelligence” by Max Tegmark. there’s an interesting controversy about why and whether the trend will continue. technology drives inequality in three different ways. find this a viable career strategy. Growing technology use clearly is linked to growing wage disparity. I think it is also linked to growing debt, because of all of the capital goods it requires. I don’t think technology or AI is sustainable. Dear Gail Thank you for this wonderful article. What would be the best investment to continue to receive a pension after 2025 2030 ? Cultivate very good relationships with your children. Move in with them. I don’t think you can get any guarantees that really work. The other idea is diversify your investments. Maybe something will work, so that you will have something. Otherwise, enjoy the time you have now. We never have any guarantees regarding the future. What would be the best investment to continue to receive a pension after 2025 2030? Learn how to produce your own food. And then take in a bunch of young people and train them. The only viable “pension” I can see is to make yourself invaluable to young people. Make sure they know that their muscles need your mind. Hmm, it’s a comforting plan, but it ignores the fact that in many peasant cultures the inheriting son usually can’t wait to knock dad on the head and push him off the farm. In India, sons were able to bribe officials to register their fathers as dead, so that they could inherit. Try to get yourself declared alive again when your son has all your assets! As for knowledge: once one has been in an area for a certain period, and know the ropes, there is little that an older head can add that would be of much use. There must come a time when you not only are but also feel useless, and there are always traditional ways in which old peasants kill themselves -usually hanging or jumping down a well. Anyway, planning to live off the young is a bit vampiric, isn’t it? The aim should perhaps be the pleasure ad duty of passing on useful knowledge, and then moving on to what awaits us all. No one stays grateful to the old forever…. Stay strong and useful as long as possible. Then die quickly. I would also point out, “Take care of your health.” This is both food and exercise, as far as I can tell. If you are in good health, you can help others. You may even be able to hold down a job at an advanced age. If you don’t take care of your health, it doesn’t matter how much wealth you seem to have. Or…. eat pizza, potato chips, and cheez wiz for breakfast lunch and dinner… drink wine and beer and whiskey by the truck load…. 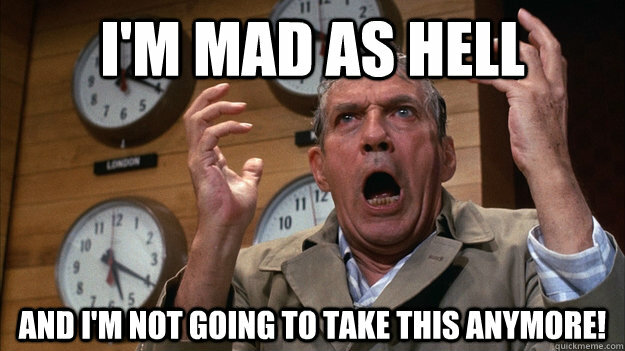 and sit in front of the teevee and watch drivel…. in anticipation of no future. 1. China’s economy is growing three times faster than theirs and growth eats debt. 2. China’s debt is 98% domestic. 4. China’s debt is productive, and of very high quality. 5. China can turn on a dime: everyone cooperates. 6. 95% of Chinese trust their government. We will see how this turns out. The mortgages of people in Beijing and Shanghai are very high in relationship to their income, for example. 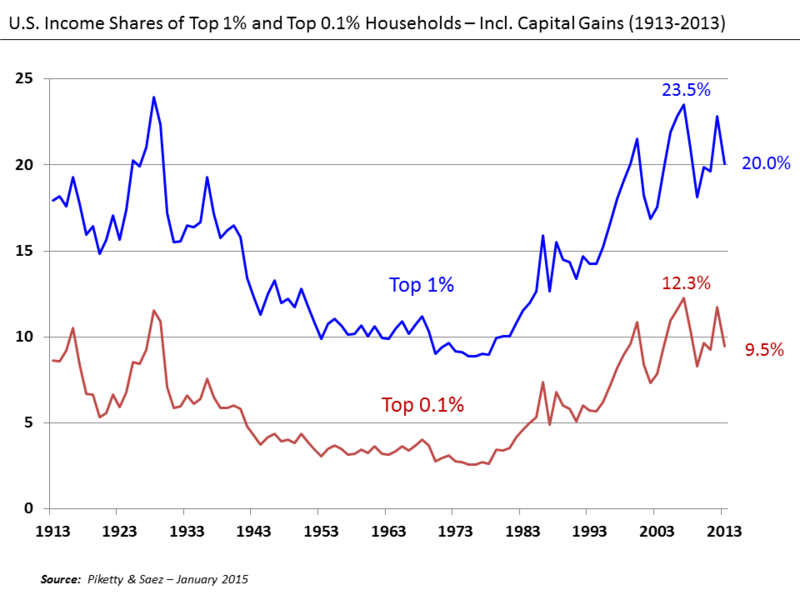 Falling asset prices would be a problem there, just as they were in the US. I know that equity amounts tend to be higher, however. I hear this rubbish all the time when I am in Hong Kong … China can’t implode because it’s too big — the leaders can do whatever they want blah blah blah blah…. China’s debt-to-GDP has ballooned to more than 300 percent from 160 percent a decade ago. Soaring debt levels and increasing complexity of the financial system have been a source of heightened concern among China watchers in recent months. A number of global bodies, like the International Monetary Fund (IMF), have warned the problems could lead to “financial distress” in the world’s second-biggest economy if the government doesn’t put in place remedial measures. The IMF estimates China’s overall debt figure to be about 234 percent of gross domestic product (GDP) and predicts it to rise to 300 percent by 2022. 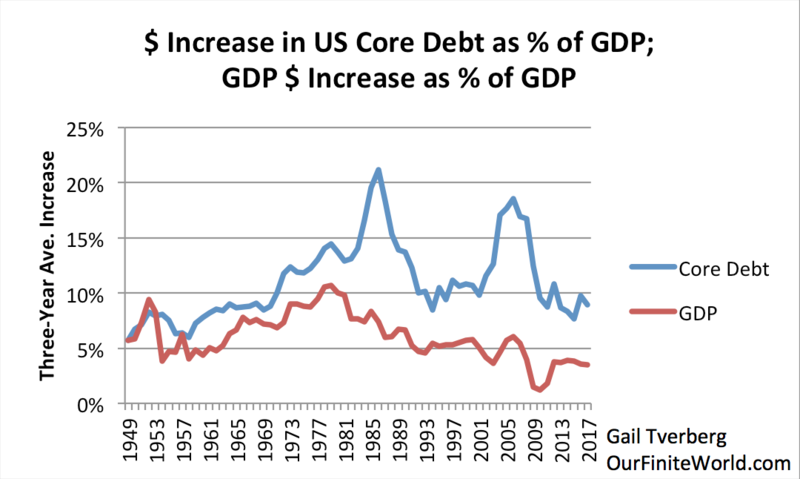 Corporate debt currently stands at around 165 percent of GDP, and household debt is also spiraling upward at a rapid pace. The rapidity and size of China’s debt boom in the past decade has been almost entirely without precedent. The few precedents that do exist — Japan in the 1980s, the US in the 1920s — are not encouraging. Most coverage has rightly focused on China’s corporate sector, particularly the debts that state-owned enterprises owe to the big four state-owned banks. 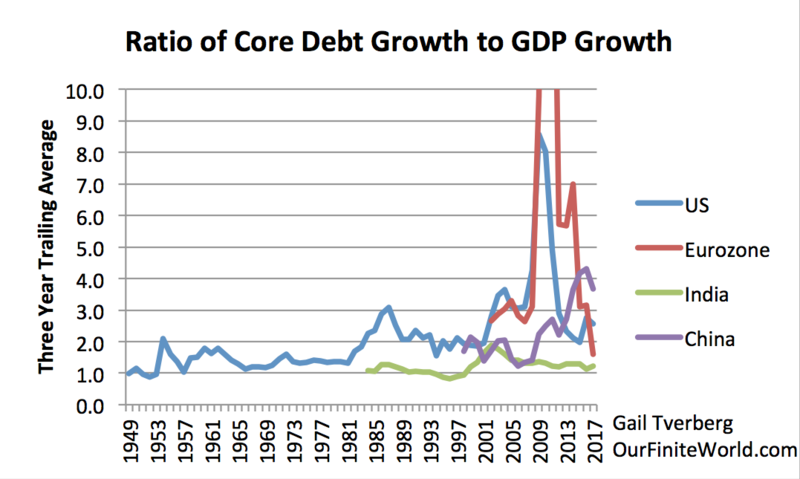 After all, these liabilities constitute the biggest bulk of the total debt outstanding, and also explain most of the total growth in Chinese debt since the mid-2000s. Chinese households, however, are quickly catching up. This is bad news. The simple story of China’s debt boom is that government-backed companies borrow from government-controlled banks to pay for wasteful investments to support jobs and other political objectives. This creates lots of problems for China today and in the future, but it does have one virtue: the losses from centralised credit allocation can be distributed over a broad population over a long period of time. While liquidating everything in one go and starting fresh may be the ideal approach, the likeliest outcome of China’s corporate debt binge still looks a lot better than the chaotic wrangling between debtors and creditors that happens in most other places at most other times. Household debt is different. Borrowers are widely dispersed and lack political power. The lenders are often newer finance companies or loan sharks. Worst of all, there is essentially zero chance that additional household borrowing pays for productive investment. Some of China’s additional infrastructure and manufacturing capacity may prove valuable one day. Household debt probably won’t. Atif Mian and Amir Sufi have ably shown that increases in household borrowing tend to predict slower income growth and higher joblessness. And if it makes you feel better — so are the US and the EU…. Apologies for mixing my metaphors, but as I see it, China and America will have to duke it out mano a mano in the sumo ring, in the woodshed, or at Thunderdome, with the winner being the side that achieves two falls, two kowtows, or a knockout, because this finite world ain’t big enough for the both of ’em to be lording it over us lesser mortals as Top Dog and lecturing us that they’re an empire now, they make their own reality, blah, blah, blah. They realize that there is no longer enough resources available at the prices we can afford to go around. That is a problem. If we could afford higher prices, that would be much less of a problem. How many of Godfree’s points ring true to my fellow Finite Worlders? In 2008, China’s total debt was about 141 percent of its gross domestic product. By mid-2017 that number had risen to 256 percent. Countries that take on such a large amount of debt in such a short period typically face a hard landing. That’s why everyone—academics, private banks, the International Monetary Fund, the Organization of Economic Cooperation and Development, the Bank for International Settlements, and People’s Bank of China Governor Zhou Xiaochuan—is sounding the alarm. 2. China’s debt may well be 98% domestic. Given China’s enormous borrowings, that tells me that nobody else wants to lend money to China. 3. Is that a fact? 4. What about all those productive high-quality empty cities China has been building? 5. I’d cooperate to if the alternative was a Naughty Mark on my social score. 6. And how would Godfree know? Has he talked personally to all 1.4 billion of these trusting souls and confirmed the veracity of their responses? In fact, do Chinese people under Communism have souls—what with the country’s ruling ideology being based on dialectical materialism? And is having a 95% trusting population necessarily a good thing for a government? Regarding (3), who values the assets? Aren’t they worth what workers can afford?